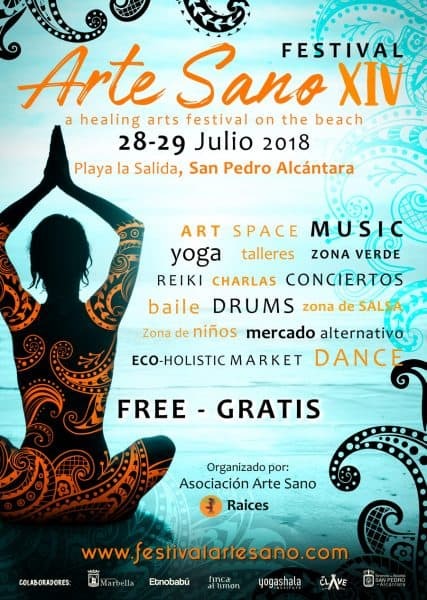 Festival Arte Sano, one of the most popular alternative festivals on the Costa del Sol celebrates its fourteenth edition on the Paseo Marítimo on Playa la Salida in San Pedro Alcántara on July 28th and 29th 2018. Arte Sano has established itself as a reference point for natural health, performing and healing arts and personal development. With a liberal mix of live music, dance, activities, workshops, classes and an alternative market, the festival offers something for everyone. The complete programme of activities throughout the weekend is published on the web site: www.festivalartesano.com. All the activities, classes and talks are free, and visitors are advised to try as much as they can to enjoy the festival. Throughout the weekend, a variety of music and artists will be performing in the concert area of the festival, also including countless shows and dance performances organized by Asociación Raíces. The festival also provides with plenty of talks and workshops around natural health, community living, massage techniques and energy rebalance. The space sponsored by Yogashala Institute is always a good option for yoga lovers, but also a great opportunity for those who would like to have a try and experience the different yoga techniques. For the dance lovers, La Clave will be offering an amazing programme of activities in their Salsa zone. The festival always offers a children space. This year Cirkiño will taking over this area and proposes a series of workshops where acting and circus lessons are taught and used to develop communicative, physical and emotional intelligence skills in a dynamic and fun way. For those interested in DIY, the Eco zone is available for all of you and will be hosted by Finca Al Limón and run by Eco Passion, where several workshops are offered by Ecoluciona, an environmental education association. Last but not least, an alternative market compounded by an amazing mix of ethnic craftwork, handmade products, therapists, natural and ecologic products, natural cosmetics and amazing healthy food. For one more year, the Arte Sano teams welcomes everyone to celebrate alternative living in all its diversity.